Champagne, the libation of celebration -- and the beverage of choice to toast the EatDrinkShopCook fantasy feast ringing in 2011. Dear Reader, there are a few things you need to do before reading this article. 1) You must suspend all disbelief and allow yourself to enter into a fantasy world of gustatory delights. 2) You cannot think in terms of calorie count, alcohol consumption or next-day repercussions. 3) Do not read this article on an empty stomach. If you agree to the above, I invite you to come with me on a journey of a no-holds-barred New Year's Eve meal. If it helps, imagine this in terms of a medieval banquet that lasts for hours and hours. Or perhaps as a last meal, into which all edible pleasures must be crammed into a single night. Whatever it takes, because really, when was the last time you totally let loose and imagined a meal of epic proportions? For the record, I haven't tried any of the dishes mentioned; I just think they sound really good. This isn't a review, nor is it written to appease potential advertisers. It's just me and my food fantasies. First, the location. It wouldn't be at my house, because I don't want to clean for guests. But a single restaurant location isn't going to cut it, either. Instead, we'll be dining in a private wine cellar somewhere -- an intimate grotto lit with candles. The serving staff is ready and waiting; they've been preparing for this evening for weeks. The table is set with every type of fork, knife, spoon, wine glass and nutcracker known to man. The Jazz Guild, a local group of young musicians, has set up in one corner of the room, and they're playing some great, funky music at just the right decibel. The cocktail hour starts with my ultimate drink of choice: Champagne. I'm not a snob about this; usually I'm completely satisfied with an American sparkling wine, preferably a blanc de noir. 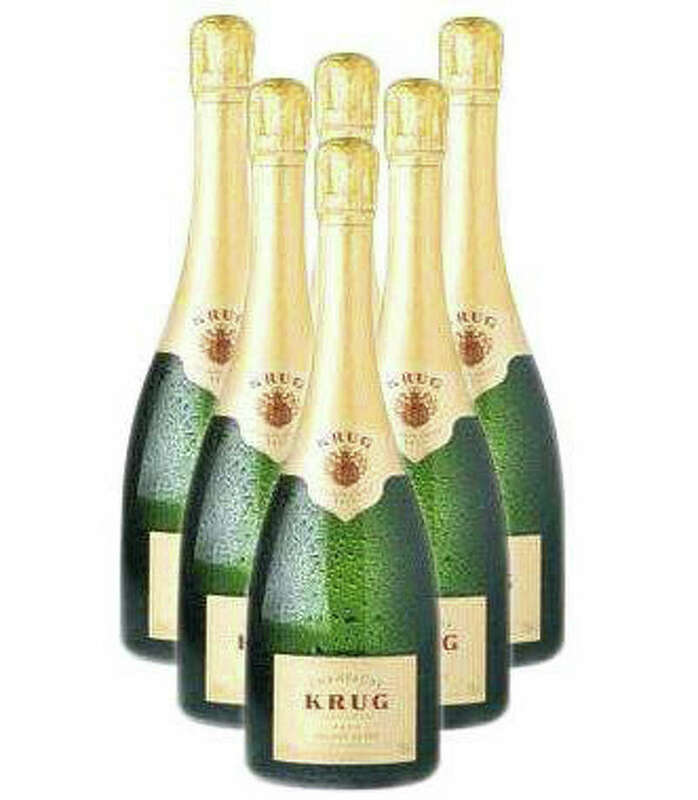 But since this evening is special (and, in this fantasy, an anonymous donor has picked up the tab), we'll be starting with a bottle of Krug Champagne Grand Cuvee ($171.49 at Harry's Wine & Liquor in Fairfield). This Champagne is a blend of 50 (50!) different wines and rated 94 points from both Wine Enthusiast and Wine Spectator. I'm expecting it to be really good. To go with the bubbly, we'll have some tasty nibbles from local restaurants. There will be tapas from Barcelona (4180 Black Rock Turnpike, Fairfield; 203-255-0800): Sweet Potato Fries with Honey Goat Cheese ($8.50) and Spicy Pork Pintxo with Cherry Peppers and Chimichurri ($9.50). It's tempting to stick with tapas, but the night is young and we have many dishes to try. The waiters tell us it's time for the salad course. But not just any salad. Tonight we'll be having the Salade De Fromages from Café Lola (57 Unquowa Road, Fairfield; 203-292-8014), a warm plate of Brie, Petite Basque, Blue, Goat and Gruyere cheeses topped with crisp green salad ($13). With that, we'll be drinking a lovely, citrusy Sancerre. Is it time for a break? Never! The sommelier is now pouring a fresh, acidic Spanish Albarino, which will go perfectly with Osianna's (70 Reef Road, Fairfield; 203-254-2070 ) Mussels Basque with chorizo, caper berries, white beans and garlic broth ($9.50). The broth is so delicious it shouldn't be wasted. Here comes the waiter now with a hot, crusty baguette from Billy's Bakery (1885 Black Rock Turnpike, Fairfield; 203-337-5349). Is there anything better than fresh bread dipped in garlicky broth? While we're on seafood, I'm also drawn to perhaps my favorite dish of all time: Stuffed Jumbo Shrimp with Crabmeat, Sauteed Spinach, Yukon Gold Mashed Potatoes and Lemon Beurre Blanc ($25). Okay, maybe we will take a short break here, just to digest and let the musicians wet their whistle. But we won't be sitting still for too long, because now it's time to get down to business. In our glasses we have an inky, tannic Malbec to go with the Red Wine Braised Short Ribs with roasted carrots, mushrooms and wide noodles from Acqua (43 Main St., Westport; 203-222-8899). And since we're going whole hog (or cow, as the case may be), we'll also have the Filet Mignon with green peppercorn sauce ($32) from Old Post Tavern (1418 Post Road, Fairfield; 203-292-8631). Let's see. Have we hit all the food groups? We've had our vegetables, grains, protein and dairy. Does wine count as a fruit? Perhaps it's time for dessert. What will it be? Cheesecake, sorbet, biscotti? Ice cream, berries, pie? All of the above. A Venetian Table to rival that of the upcoming British Royal Wedding. Not just cannoli and anisette cookies, but chocolate fondue, gelato, cupcakes and Belgian chocolates. Can we handle a glass of Port after all that? Midnight finally arrives, and we all toast to the New Year. Hugs and kisses all around, confetti and horns. And so our fantasy evening comes to an end. You know what they say: Eat, drink and be merry, for tomorrow we shall diet. What will I really be having on New Year's Eve? Check out the EatDrinkShopCook blog online at http://blog.ctnews.com/woods/. E-mail Patti Woods at eatdrinkshopcook@gmail.com.